With the finals back in Texas (after an unbearable two-year break!) and first round games in Dallas, there’s even more excitement and anticipation than normal. Who will make the Final Four this year? We’ll have to find out. Of course, one thing we know for sure is that injuries to key players will be the difference between winning and losing for at least a few teams in the tournament. That’s just part of the game, whether you’re bound for the NBA, a teen shooting street hoops, or a 45-year-old accountant playing pickup ball on Saturday mornings. While perfect injury prevention is impossible, the good news is that, by training, practicing, and playing the game the right way, you can significantly reduce your risk. Here are some tips to keep your body—and especially your feet and ankles—as far out of harm’s way as possible. You don’t have to be a high-performance athlete to enjoy the sport of basketball. So what if you aren’t taller than a skyscraper, and you can’t run like the wind or jump more than a few inches off the ground? It’s all about fundamentals, right? In all seriousness, while it’s true that people of all ages and ability levels can enjoy a game with others, it is important that you keep yourself in good enough physical condition to handle the physical stresses of the sport. If the only court you’ve visited in a while is the food court, don’t try to play competitive games right away without working your way up. During the offseason, make sure you get regular aerobic exercise and work on your strength and flexibility. If you’re a bit (or more than a bit) out of shape—be honest—it’s a good idea to start slowly with what you can handle and gradually increase the intensity of your workouts over several weeks. If you try to go from zero to midseason form too quickly, your risk of a serious foot or ankle injury will skyrocket. No, you don’t need a $200 pair of Air Jordans to get the most out of your basketball experience. But on the other hand, if you try to get away with playing in the same blown-out pair of general-purpose athletic sneakers that you wear every day—or even a newish pair of running shoes—you’re playing with fire. Sport-specific shoes really are a must if you’re going to play regularly. Basketball shoes offer many features designed not just to improve performance, but also prevent injury. The most obvious visual difference is that basketball shoes are tall with high cuffs, which reduces the risk of rolling and spraining your ankle after quick stops, cuts, and landings. Basketball shoes also generally offer great traction, relatively rigid soles, and plenty of cushioning to help with all that running and jumping. 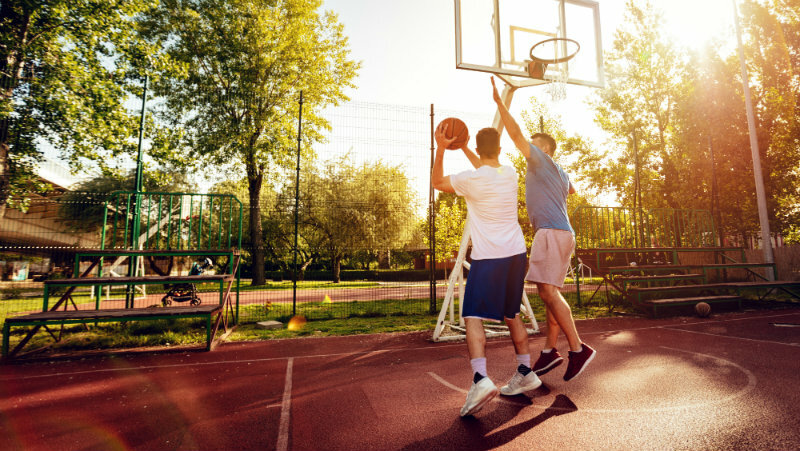 Because basketball shoes take a pounding, the midsoles can wear out relatively quickly and lose their ability to protect your feet, even if the exterior of the shoe otherwise appears to be in good shape. If you play 2-3 times per week, you might need to think about replacing your shoes every 3-4 months. Never consider buying or using used basketball shoes. Beyond shoes, an ankle brace and/or a pair of custom orthotics designed for athletic use may be appropriate for some individuals with diagnosed foot and ankle problems, especially with their biomechanics. “Cold” muscles that are suddenly asked to perform vigorous, high impact motions are more likely to suffer a painful injury. Warming up allows you to prepare your body for the game slowly and safely. Start with about five minutes of cardio—jogging in place, jumping jacks, etc. After that, do some stretches to loosen up. Cool down after the game with a few minutes of walking, too. This allows your heart to return slowly to its resting level, which is healthier and safer. It also helps your body flush toxins from your system more efficiently so you won’t cramp up as badly or feel as sore afterward. Basketball is physically demanding, even for seasoned athletes. 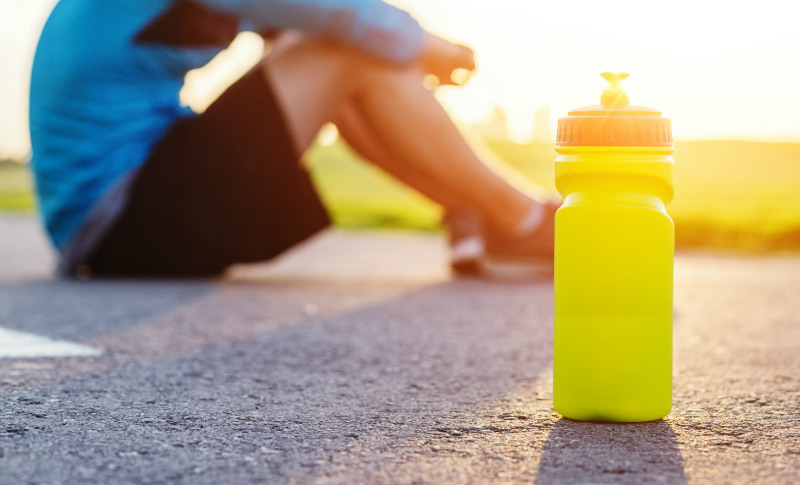 Dehydration can come quickly, and can really increase your risk of hurting yourself (not to mention significantly reduce your athletic performance). Drink a couple of glasses of water (16-24 oz) or non-caffeinated sports drink a few hours before your game, and then another glass right before the game begins. Hydrate as needed throughout the game. On average, this is about a cup’s worth (8 oz) of fluid every 20 minutes of activity. It’s better to err on the high side here, since if you begin to notice the signs of dehydration, you’re already past due for another water break. If you’re lucky enough to play indoors, you probably don’t have to worry too much about the condition of the court. As long as the roof isn’t leaking and the temperature is at least somewhat controlled, you should be fine. Those who play on outdoor courts, however, should make sure both the court and weather are safe for play. Avoid playing in extreme heat, humidity or rain, or on courts surfaces covered in water or pockmarked by potholes and debris. Make sure the lighting is good and the court boundaries aren’t overly close to walls, structures, or other hazards. Overtraining is probably the biggest single contributor to athletic injuries, including basketball. Simply put, you need to give your body, feet, and joints time to rest and recover. Otherwise, you risk developing chronic injuries like heel pain, stress fractures, shin splints, and the like. If you’re playing basketball at full speed nearly every day, or playing high-impact sports year round with no offseason—even sometimes multiple sports or teams at a time—you’re more likely to wear down both physically and mentally. Take at least one season off per year—even the pros get an offseason! On your off-days and offseason, stick with lower-impact exercises like cycling, swimming, and strength training. You have to listen to your body. A little bit of mild stiffness or soreness is one thing. But pain, whether it comes during or after the game, is not normal and a sign that you should seek out medical attention. Ignoring a nagging injury is only going to drag it out and make it worse in the long run. Don’t let March Madness turn into March rage over a preventable foot injury! For foot and ankle sports injury treatment you can trust, call Richardson Podiatry. Our experts are here to make sure you can return to the court as quickly and safely as possible. You can reach our office to book an appointment at (972) 690-5374, or complete a contact form online.